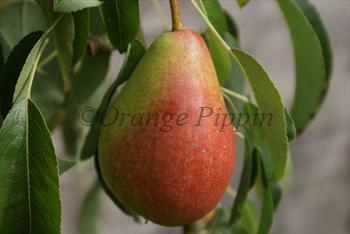 Louise Bonne is an old French pear variety, with a surprisingly modern "bi-coloured" appearance - the yellow/green skin usually has an attractive red flush. As a bonus the blossom is also more attractive than most pear varieties. Louise Bonne was rated by the Victorian fruit enthusiast Robert Hogg as "A most delicious pear" - a description which is just as valid today. The flesh is sweet and melting, with a pronounced pear flavour. Judging the right time to pick can be tricky, but keep a close eye on it from late August onwards (in the south of the UK, a bit later further north) and pick the pears when they are flushed but still quite hard - then ripen in a fruit bowl. 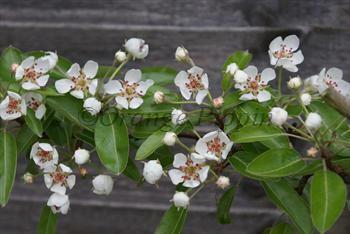 Please fill in the details below and we will let you know when Louise Bonne of Jersey pear trees are back in stock. Louise Bonne of Jersey is in flowering group 2. Louise Bonne of Jersey is self-sterile and needs to be pollinated by another tree of a different variety nearby. Louise Bonne is a reliable cropper and can be grown in most situations as long as it gets shelter and full sun. This pear originated in Avranches, Normandy, France in the 1780s, where it was known as Bonne Louise or Louise d'Avranches. It was soon taken to Jersey in the nearby Channel Islands, and from there became popular in Victorian England, where it was known as Louise Bonne de Jersey.